It's my turn today at the Great Impressions Blog. And I have a card showcasing summer romance! :) I really wanted to use F515 Lg Eiffel Tower. And somehow this card popped into my head. Then I used the sentiment A137 Je t'aime for a perfect sentiment. I embossed both images with Ranger's platinum embossing power. 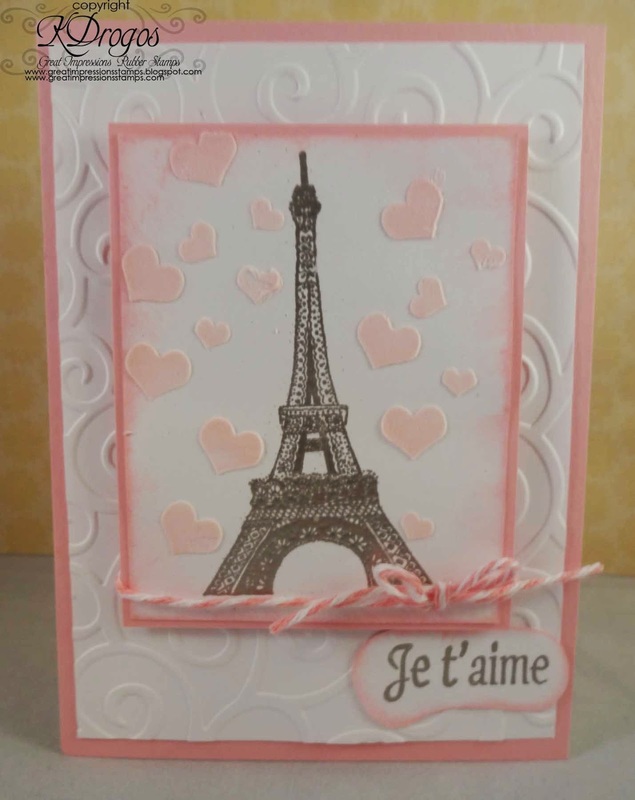 For the hearts I used light modeling paste, Stampin Up Pretty In Pink Re-Inker, and a Heidi Swapp embossing folder. Thanks for stopping by! Find more inspiration from our Pinterest boards! Until next time my friends...Have a beautiful day! WOW!!! This is gorgeous! I loveeeeeeeee that Eiffel Tower!!! !